Stacy Horn » Blog Archive » Presents!!! Ohmygod. Every once in a while the readers of this blog send me very nice things in the mail, Citizen Reader sent me a great big box of homemade Christmas cookies and other treats last December! So Nora was visiting here from Canada and we were supposed to meet for lunch, and she CANCELS on me (she was sick) and a few days later—PRESENTS!! I need to shoot a close-up of these so you can really see the stone. THANK YOU, NORA!! Labradorite is one of my favourite stones. Someone in a jewelry store I used to frequent here in Ottawa told me about a couple flying a small plane over Labrador and seeing a beach which appeared to be shining and a most unusual colour. They landed and apparently found a beach covered in Labradorite. They collected the stone by the bucketful. No idea if this is true or not. I was in Labrador once (it is part of the province of Newfoundland and is physically located along the north eastern coast of Quebec, more or less) and I did not see it just lying about! Labradorite is also found in other locations around the world. Boy do you have beautiful skin – hardly a wrinkle. Just like your Mom!! Karen, how nice of you to say so! You look great yourself, by the way! 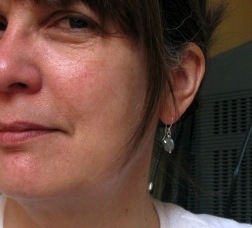 Nora, your earrings are getting compliments, someone emailed me that they loved the labradorite stone too.